Environmental Working Group (EWG) has been bringing more power to the people for years with their handy consumer guides. From safer sunscreens to produce with fewer pesticides to the safest cell phones to meat that won’t compromise your footprint and much more, EWG strives to cover the products and issues that matter to consumers. Right now, EWG is offering a sneak peek at their newest guide, due for release in fall 2012, the EWG Cleaners Database. 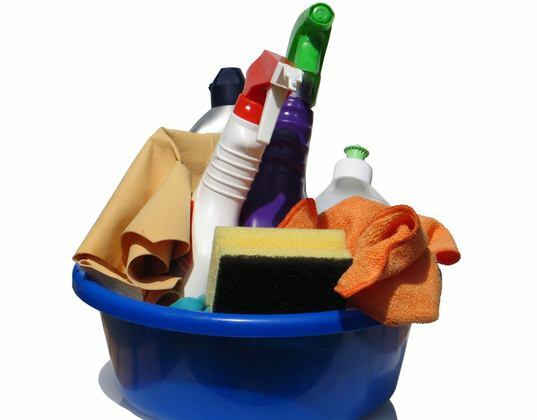 This new guide will provide an in-depth look at common household cleaners on the market and highlight health concerns of cleaners you likely have in your home right now. EWG notes, “Already, our research has turned up products loaded with extremely toxic compounds banned in some countries. Some of their ingredients are known to cause cancer, blindness, asthma and other serious conditions. Others are greenwashed, meaning that they are not, as their ad hype claims, environmentally benign. Still more hide the facts about their formulations behind vague terms like ‘fragrance.‘” Although the new guide is months away, EWG is empowering consumers now by releasing some of their new EWG Cleaners Hall of Shame. The list, published in anticipation of the full database, highlights some of the worst of the worst cleaning offenders out there. Keep reading to see which cleaners scored a place in the Hall of Shame. Image by lusi via sxc. Simple Green Concentrated All-Purpose Cleaner: Labeled “non-toxic” and “biodegradable” but really this cleaner contains 2-butoxyethanol, a solvent absorbed through the skin that damages red blood cells and irritates eyes plus chemicals banned in the European Union. Citra-Solv Cleaner & Degreaser: Markets itself as safe, but really contains 85% to 95% d-limonene, which can react with trace levels of ozone air pollution to form ultrafine particles that penetrate deep into the lungs and formaldehyde, which the U.S. government classifies as a known human carcinogen. Scrubbing Bubbles – Antibacterial Bathroom Cleaner & Extend-A-Clean Mega Shower Foamer: This product is banned abroad, but not here in the USA, and contains up to 10 percent DEGBE, which can irritate and inflame the lungs. Target’s Up & Up brand: Fails to list ingredients on the product packaging or lists only one or two ingredients or uses vague terms. Glade air freshener: Comes with a warning that, “Intentional misuse by deliberately concentrating and inhaling the contents can be harmful or fatal.” Great, since it’s a product you spray all over your home! These and other cleaners will be featured on the new EWG cleaners database, but until the full database report is published, you’re probably better off making your own homemade green cleaners. Environmental Working Group (EWG) has been bringing more power to the people for years with their handy consumer guides. From safer sunscreens to�produce with fewer pesticides to the safest cell phones�to meat that won't compromise your footprint�and much more, EWG strives to cover the products and issues that matter to consumers. 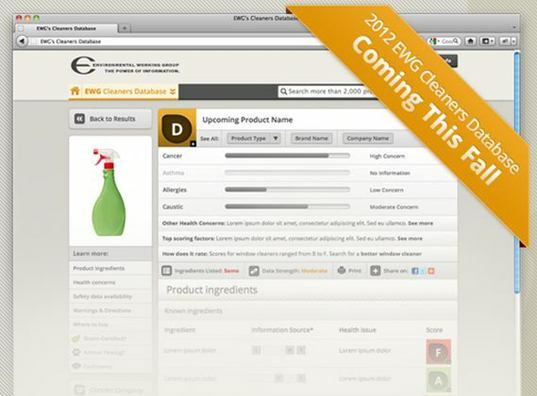 Right now, EWG is offering a sneak peek at their newest guide, due for release in fall 2012, the EWG Cleaners Database. �This new guide will provide an in-depth look at common household cleaners on the market and highlight health concerns of cleaners you likely have in your home right now. EWG notes, "Already, our research has turned up products loaded with extremely toxic compounds banned in some countries. Some of their ingredients are known to cause cancer, blindness, asthma and other serious conditions. Others are greenwashed, meaning that they are not, as their ad hype claims, environmentally benign. Still more hide the facts about their formulations behind vague terms like 'fragrance. '� Although the new guide is months away, EWG is�empowering consumers now by releasing some of their new EWG Cleaners Hall of Shame. The list, published�in anticipation of the full database, highlights some of the worst of the worst cleaning offenders out there. Keep reading to see which cleaners scored a place in the Hall of Shame.